This book is devoted to the theory of entire Hermitian operators, an important branch of functional analysis harmoniously combining the methods of operator theory and the theory of analytic functions. This theory anables various problems of classical and modern analysis to be looked at from a uniform point of view. In addition, it serves as a source for setting and solving many new problems in bot… h theories. 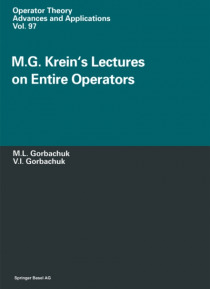 The three chapters of the book are based on the notes written by his students of M. G. Krein's lectures on the theory of entire operators with (1,1)- deficiency index which he delivered in 1961 at the Pedagogical Institute of Odessa, and on his works on the extension theory of Hermitian operators and the theory of analytic functions. The theory is further developed in the direction of solving the problems set up by Krein at ICM-66 in the first two appendices. The first concerns the case of Hermitian operators with arbitrary defect numbers, entire with respect to an ordinary gauge and to a generalized one as well. The other focuses on the entire operators representable by differential operators. The third appendix is the translation from Russian of the unpublished notes of Krein's lecture in which, in particular, the place of the theory of entire operators in the whole analysis is elucidated. In Krein's mathematical heritage the theory of entire operators occupies a special position.